Galactic bars are thought to contribute to the dynamical evolution of their host galaxies. Numerical studies show that they can funnel in gas from the outskirts to the central regions of the galaxies, triggering star formation and possibly AGN activity. It is still unclear whether bars actually help trigger AGNs, as previous studies have produced conflicting results and tend to suffer from small number statistics and biased AGN diagnostics. In today’s paper, the authors bring better tools to bear on the problem, by utilizing the large wealth of information from the SDSS Galaxy Zoo citizen science project and X-ray stacking analyses. The authors first selected a sample of ~100,000 local spiral galaxies from SDSS that have been visually classified as such in Galaxy Zoo by at least 20 people. This sample is later divided into three redshift bins that are each complete in stellar mass, i.e. there are galaxies that span the whole range of stellar masses in each redshift bin. This is to ensure the final results are representative and unbiased. They distinguished sources with and without bars in these three redshift bins using information from Galaxy Zoo, based on the fraction of votes to the question “Is there a sign of a bar feature through the center of the galaxy?”. If the fraction of votes is equal or greater than 0.25, the galaxy is defined to have a bar; if the fraction of votes is less than 0.1, the galaxy is defined to be bar-less. Galaxies with fraction of votes between these two numbers are defined to be ambiguous. Figure 1 shows some examples of spiral galaxies with bars, no bars, and ambiguous bars in their sample. In contrast to optical light which is absorbed by dust, X-rays from an AGN can more easily pierce through dust obscuration. Stacking lots of X-ray observations help to reveal heavily-obscured or low-luminosity AGNs. Using data from the Chandra X-ray observatory, the authors performed X-ray stacking analyses to investigate the presence of AGNs in their barred, unbarred, and ambiguously barred samples. Figure 2 shows the X-ray luminosity of their samples after subtracting the contributions from star formation processes. The three types of spiral galaxies do not show obvious differences in their X-ray luminosities, suggesting that AGNs are no more common in one type of galaxy than the others. For galaxies with X-ray detections (i.e. 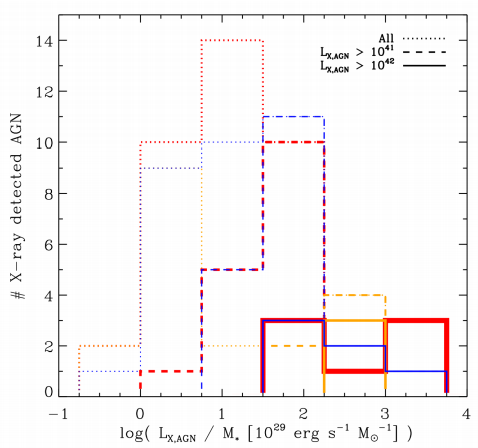 hosting AGNs), the authors further investigated the distributions of their AGN specific accretion rates, which are the X-ray luminosities divided by the host galaxy stellar mass shown in Figure 3. This ratio removes the dependence on stellar mass and instead probes the dependence on the host galaxy properties. There is again no difference in the accretion rates between the barred and unbarred samples. Well, all that is a bummer — the presence of AGNs in spirals seem to be independent of the presence of bars. For those with AGNs, there is also no difference in the specific accretion rates of their host galaxies on the basis of a bar existence. As stacking analyses tend to wash away short timescale events, any bar contributions to AGN activities would need to be very short-lived. This study shows that over the lifetime of the galactic bars, they do not play significant role in triggering AGNs — astronomers need to turn their eyes to other means of growing black holes in spiral galaxies.